Aisha Khan, co-owner of Twelve Gates Arts in Old City, seated next to an installation in the series 'Another Day Lost' by Syrian-born artist, Issam Kourbaj. This series is inspired by aerial images of refugee camps in Syria. Walking through a huge art museum or one of the galleries in Old City, it's difficult not to be moved by some of the works you'll see. Art, in its many forms, has an incredible ability to change our perceptions, provoke latent emotions and boost our spirits all at once. 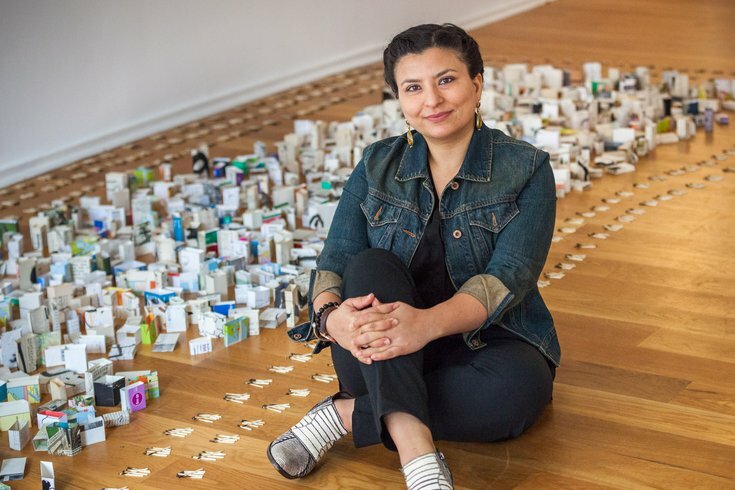 Recognizing the importance of visual arts in the community at large, Aisha Khan, co-owner, president and executive director of Twelve Gates Arts, continues to lead the Old City gallery with social change in mind. Opened in 2011, the gallery showcases the work of modern South Asian and Middle Eastern artists and artists from the diaspora of those regions in an effort to promote cross-cultural community and understanding. Through monthly exhibits, programming and community salons, Twelve Gates highlights international artists that might not otherwise find a home among Old City's many gallery walls. Ahead of the gallery's third annual fundraising gala, Khan took the time to chat with us about how her work with Twelve Gates and what she loves (and sees lacking) in Philly's arts scene. You have backgrounds in social work and financial analysis in addition to the art world – how do you think your diverse experiences help you in your work with Twelve Gates? Like most people who start nonprofits, I started Twelve Gates, because I had a passion for social change. Sadly, so many nonprofits fail early in life because whilst there's passion in their genesis, there's a lack of solid business acumen in management. That's where my financial background really helped me run the business. We showcase such a wide range of art at the 12G and have such a diverse board that it's easy to get lost in all these beautiful exhibitions - so I am grateful that I have a little voice in the back of my mind reminding me that there are spreadsheets and numbers that need to be crunched! Who are some of your favorite South Asian artists working today? As a gallerist, I come across [many] wonderful artist and mind-blowing works all the time, and as a consultant I advise clients on buying art, but that involves understanding the client and the market -- not pushing my personal favorites ... I can tell you who I'm thinking about this week but he's not South Asian. Issam Kourbaj is a Syrian artist, but still. Kourbaj has created a traveling installation work composed of little tents made out of recycled books that are laid out like a refugee tent as seen aerially [shown with Khan, above]. It's a very powerful work that is sure to provoke conversations about a current crisis happening in our world. What’s the most challenging part of running an art gallery? Not enough months in the year or hours in the day! There are so many great artists we want to showcase but we simply don't have the capacity to showcase them all. On a practical level, trying to keeping up with and filing grant applications when you would rather be sourcing new artists can be a struggle (that's where that little voice in the back of my head comes in handy). Finally, publicity can be so difficult! While there are loads people who want to see the art it can be hard to get the press out to see the work every time, and getting the maximum number of people to see the work is part of the our mission. Twelve Gates’ gala is coming up this May – how will you interpret the theme "Gothic Glamor: Desi Style If You Please" for yourself? I know I will be struggling with this until the last minute. I can't pick up my F. Scott Fitzgerald for inspiration this year again -- which is great as it encourages me to get creative! Cue is fashion-as-performance-art. In a perfect world, I'd like to be able to carry something like a Gareth Pugh design or Alexander McQueen and mix it up with a 17th century Hindustani aesthetic. What do you love about the Philly art scene & what do you think it could improve upon? The Philly art scene has a lot going for it. There's diversity and there's drama. We have great museums. Studio spaces are abundant and there is so much creative room to expand upon the art corridor of American street. Art writing coming out of Philly is a bit lacking though and I wish there was more coverage of art on front covers everywhere. Click here to learn more about Twelve Gates' Third Annual Gala.